To find their inspiration for Carl and Ellie Frederickson’s dream adventure, director Pete Docter and nine of his Pixar cohorts trekked through the South American jungle. Among the inspiring landscape was Angel Falls, the world’s highest uninterrupted waterfall, which became Paradise Falls for the movie. Many of the places and attractions in Cars were directly inspired by a Route 66 road trip John Lasseter took with his wife and kids. 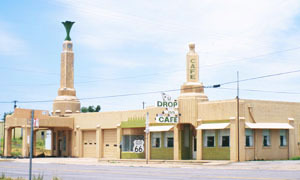 Ramone’s Body Shop, for example, is a near-exact replica of the U-Drop Inn, an historic art deco gas station and restaurant built in 1936 in Shamrock, Texas. The palace where Rapunzel was stolen from her parents was inspired by the styles of many castles, but one thing was certain from the very beginning: It had to be situated on an island like Mont Saint-Michel in Normandy, France. Creating the Beast and his environment was proving to be a bit challenging for animator Glen Keane—but then he and his crew visited the Chateau of Chambord. “It was an ominous, impressive place with all of these spires and just standing there before us," he said. "I mean I’ll never forget the morning driving up there through the mist and fog and seeing it there. I thought, 'This is the Beast’s castle. This is where he lives.'" When Walt and Lillian Disney took a little European vacation prior to the construction of their theme parks, one of their stops was Neuschwanstein, a 19th-century Bavarian castle commissioned by King Ludwig II in 1869. When the Disneys came back to California, they used elements of the fairy tale-like architecture in Sleeping Beauty Castle, Disneyland’s centerpiece. Just like Ramone’s Body Shop, Cadillac Range, the geological formation near Cars' Radiator Springs, was inspired by a famous Route 66 attraction. The “Cadillac Ranch” near Amarillo, Texas, was created in 1974 as an art installation. You probably thought Elsa’s icy powers were just fiction, but the creators of this ice hotel in Quebec City know otherwise. Director Chris Buck stayed at the Hotel de Glace to do research about five years before Frozen was released, studying ice structures and snow construction. 8. The real place: Storybook cottages in the Los Feliz neighborhood of L.A. Many people think these Loz Feliz cottages were inspired by Snow White, but it’s actually the other way around. The cottages were designed and built by architect Ben Sherwood in 1931, and Snow White wasn’t released until 1937. At least one of the animators who worked heavily on the movie lived here while he worked on the film. Despite a long-persisting rumor (and many, many Internet articles), The Lion King’s Pride Rock is not based on a real-life counterpart in Hell’s Gate National Park in Kenya. “We took a trip to Kenya to research the animals and the landscape for the movie,” co-director Roger Allers has admitted. “There are certain things lifted from the landscape, but we used a variety of inspirations. Many people try to say, 'Pride Rock is based on this mountain here,' but they are wrong. An artist in Burbank invented Pride Rock."